As most of us will have seen on either MasterChef or My Kitchen Rules, crunchy, perfectly golden crackling can not only win the hearts of the judges, it can be the difference between second place and a truckload of money. Although this isnt the case for most of us, (much to our disappointment) getting the crackling just right comes down to a few key steps. 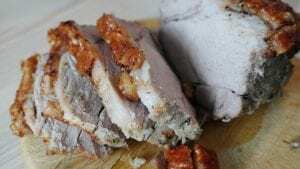 Step 1:Choosing the right cut is important as crackling is crafted from the rind or the skin that sits above the layer of fat and meat on a piece of pork. So, to get the best results try using a pork collar (a boneless shoulder) which make for easy stuffing and even easier carving. Or try using a pork bellyor arack (which we can wrap extra skin around it making for even more crackling!). Step 2:Ask one of our Butchers to score the pork skin for you or alternatively you can do it yourself with a very sharp knife or a clean Stanley knife. The slashes should be parallel to one another and should be about 1 cm apart. Be sure to only cut the skin. If the slashes are too close to the meat, the juices will escape. Step 3:Boil some water and pour it over the skin, this will cause the skin to tighten, exposing the slits and creating more surfacearea. After drying the skin with kitchen paper, massage a generous amount of salt into the skin and well into the slits, this is what causes the skin to get puffy and crispy. If salt isnt rubbed in well enough youll end up with chewy crackling. Then pop it into the fridge to sit overnight. Step 4: Take the pork out of the fridge, gently brush the salt off and dry the skin once more with a paper towel. Rub olive oil and vinegar or lemon juice into the skin. This will help with transferring the heat of the oven to the skin. Step 5: Put the pork in a hellishly hot oven at 220 C for roughly 20 minutes, which is a sure-fire way to get the skin sizzling. Then after 20 minutes,drop the heat back by bringing the temperature down to 180 C.Rule of thumb: Cook the pork for roughly 45 minutes per kilo. Step 6:If the juices are clear when you prod the pork with a thermometer (the internal temperature should be 70C) or skewer its cooked. If its milky, keep it roasting and continually check it. Once out of the oven resist the temptation to hack into the pork. Allow the pork to rest for 20 minutes before enjoying the wonderful creation that is Pork Crackling. What to do if your crackling isnt exactly crackling If your crackling is a flop, dont give up. Gently take it off the meat after cooking and put it skin side up on a piece of foil under the grill or in the oven at 220ʼC. Be on a careful watch to make sure it doesnt burn. Once its puffed up and golden, take the skin out and admire your handy work. The post The steps to achieve Glorious Pork Crackling appeared first on Sunshine Coast Organic Meats.